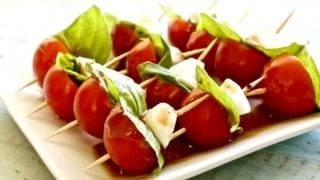 Easy caprese salad bites on a toothpick drizzled with a rosemary balsamic dressing. These easy and adorable appetizers are Low-Carb, Low-Sugar, Vegetarian, Gluten-Free. These little gems are perfect for summer dinner parties, Holiday bashes or anytime really. Try them for lunch! Looking for more appetizer ideas? Our appetizer section is full of great recipes you may be interested in. Our salad and sides recipes offer even more variety and party food ideas! 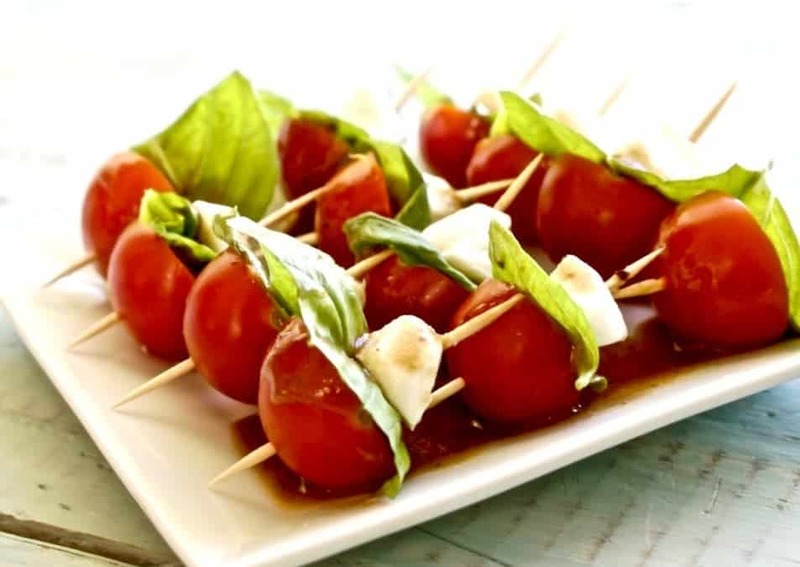 This Caprese Salad Bites recipe is so simple; I blush just publishing it. But it’s such a tasty, easy and healthy appetizer you are going to want this recipe! In a handful of people now a days, someone is bound to have special dietary needs. The healthy bases are pretty much covered in these delicious little salad bites. And they do just what an appetizer should. Your party guests will enjoy a flavorful, healthy tidbit to snack on while visiting before dinner. And they will still have an appetite! Perfection indeed! Our cherry tomatoes are ripe just now! They are perfect for Caprese Salad Bites. This is such a great recipe for home gardeners. 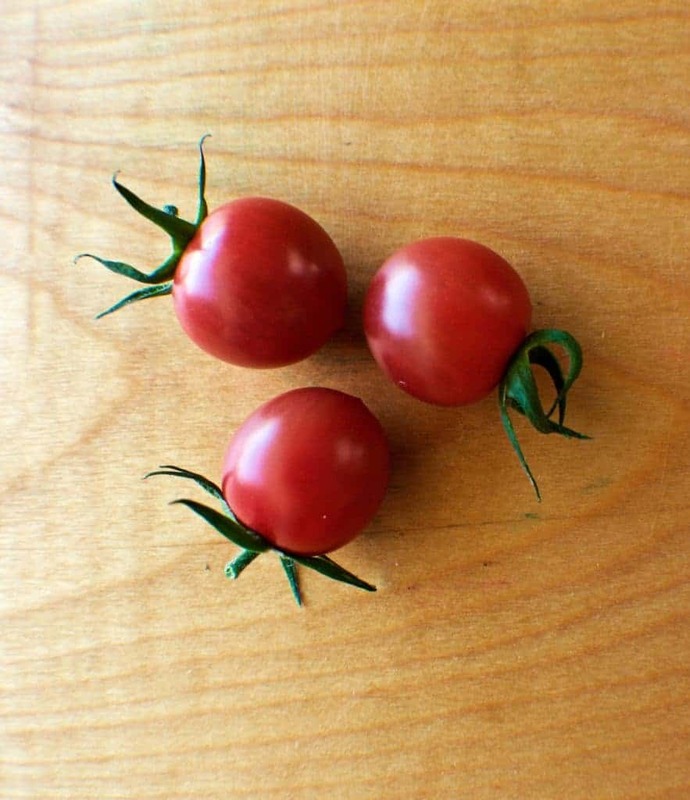 The flavor of homegrown tomatoes just can’t be beat. If you don’t garden, try to find a source of fresh, organic, locally grown, produce for the summer months. It’s so worth it! For us, A quick trip out to our garden and greenhouse and we have the freshest, most flavorful tomatoes and Basil. Add the mozzarella and balsamic dressing and viola! A healthy quick and easy light lunch or party food for your friends and family. Love that! Finding safe foods to bring to summer outdoor parties at the beach, park or other outdoor events can be a challenge. Mayonnaise and other foods that require refrigeration are not practical for hot days outside. 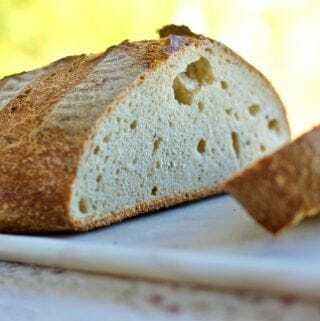 Here is an easy, appropriate recipe that is safe outside and so easy to assemble on the fly! A Note on the salad dressing: I used a store-bought dressing for this, because I’m lazy. BUT, my creamy balsamic Dressing is a good homemade option. It goes another direction in flavor, more honey mustard. It would be good though, and healthy, just different! My Creamy Balsamic salad dressing is made of healthy ingredients and is about 32 calories a serving. Chop the mozzarella into small squares, balls or wedges. 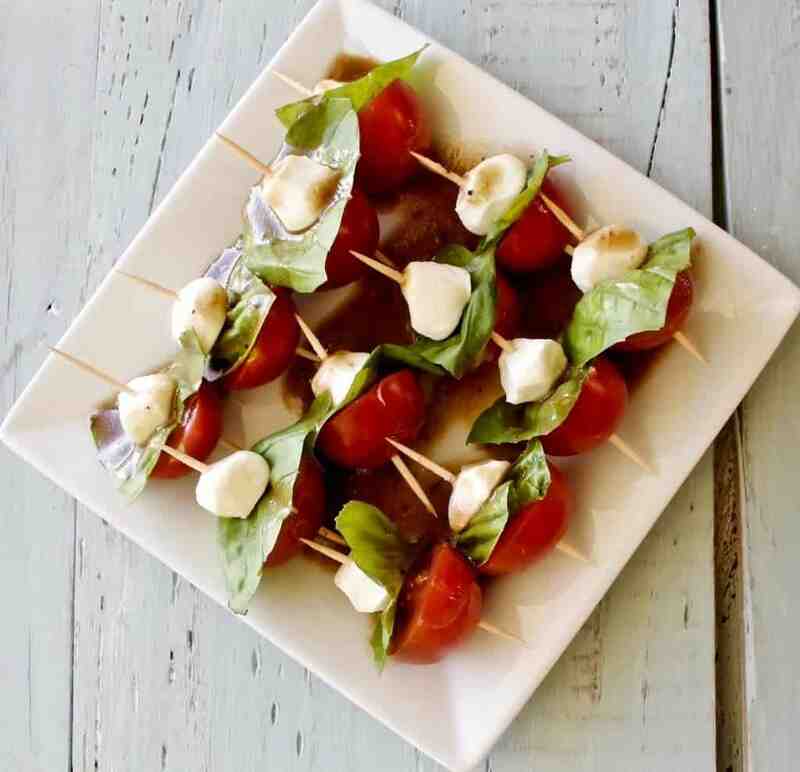 load a cherry tomato half, basil leaf, and mozzarella ball on a toothpick. 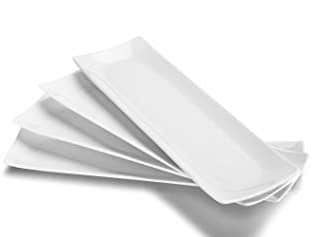 lay them side by side on a plate or tray until you have the number you need. Then simply drizzle them with your favorite balsamic rosemary dressing. Or my creamy Balsamic Salad Dressing is a homemade option that would be great with this recipe! We didn’t need 24 on the day I made these. So I only made 12. 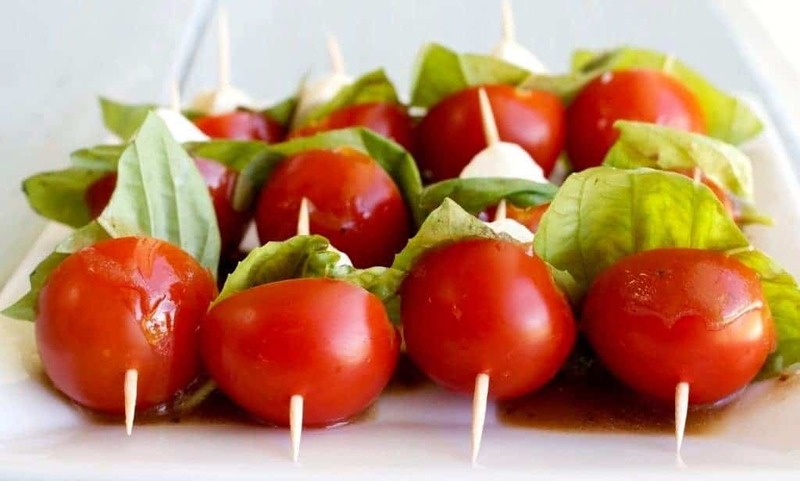 A full recipe will give you 24 Caprese Salad Bites. 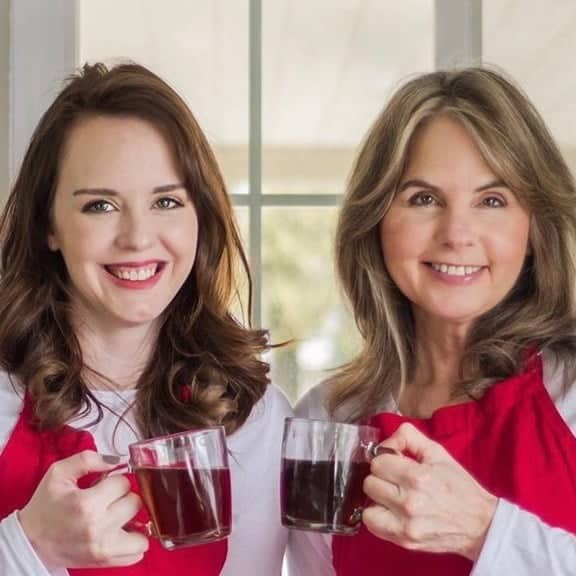 if you are feeding a larger party… just double the recipe. 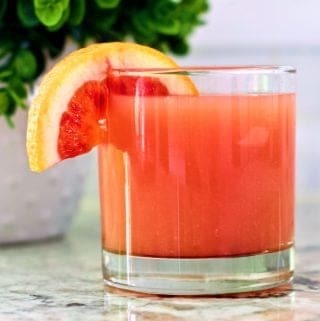 Enjoy this healthy treat. We loved them! Without salad dressing this recipe is very healthy and low carb. You choose the salad dressing to suit your diet needs. and add those calories in as well. Easy caprese salad bites on a toothpick drizzled with a rosemary balsamic dressing. These easy and adorable appetizers are Low-Carb, Low-Sugar, Vegetarian, Gluten-Free. 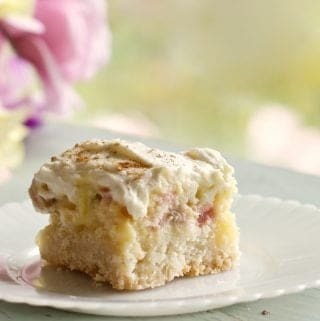 These little gems are perfect for summer dinner parties, Holiday bashes or anytime really. Then simply drizzle them with your favorite balsamic rosemary dressing. This recipe calls for a purchased rosemary balsamic salad dressing. The calories of this recipe are posted WITHOUT a calorie count for the dressing. 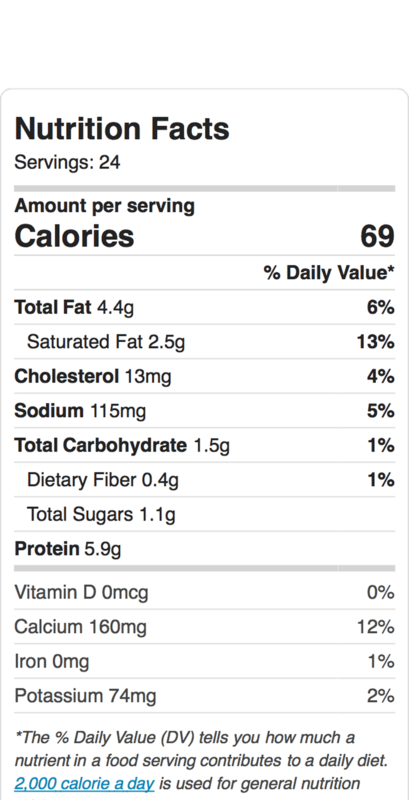 Read the label of the dressing you choose and use the calories for a 2 Tablespoon serving. Then divide that calorie number by 24 servings and add that to the calorie count to determine the total calorie count per serving. OR Try our Homemade Creamy Balsamic Salad Dressing on this appetizer for a nice healthy change up. About 32 calories per tablespoon which is adding only 2.6 calories per serving for a total of about 61 calories per salad bite. 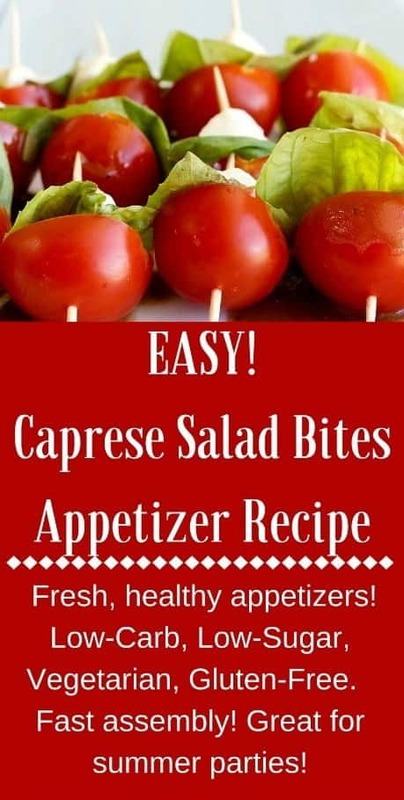 I love these caprese salad bites! These are perfect appetisers for summer parties! I love capreses! And your recipe will be perfect as an appetizer for the barbecue season! That’s a great idea Del! Love the summer!! Mmm yum! A great healthy appetizer idea! Love it! Lol, Sandi, you have smart kids! It’s a perfect simple recipe. NEVER blush from publishing something that is drop-dead simple like this. There are plenty of people who haven’t thought of it yet….we need simple! These are perfect and loaded with flavor, Great for my next party. These are always a hit at any party, the first thing to go!! Simple elegance at its best Diane! I agree Angela, they are tasty! I love that you put a salad into skewers! Such a fun idea! 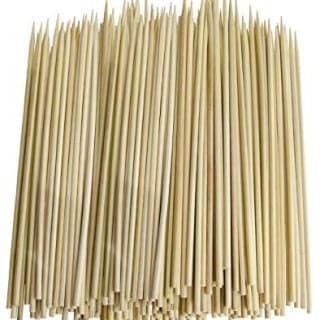 Hi Nettie, The skewers make them easy finger food. So handy for a party! You must have known that caprese is my favorite salad! I love this idea! 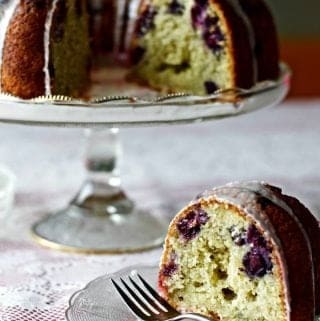 It looks so delicious that it makes my mouth water! These are a popular fun snack, Theresa! A gorgeous photo and a fantastic summer appetizer. Caprese flavors lend themselves to so many dishes. I love this creation and one of the best things about it is the ease of preparation. Perfect party fare. Thank you KC. I agree all around. These are a keeper!